With 10 different ballparks to choose from, baseball fans that head to Arizona during the Cactus League spring training season have plenty of options if they want to catch America’s pastime in a more laid-back environment. Today, we take a look at the newest stadium of the bunch as we travel to Sloan Park, spring training home of the Chicago Cubs. 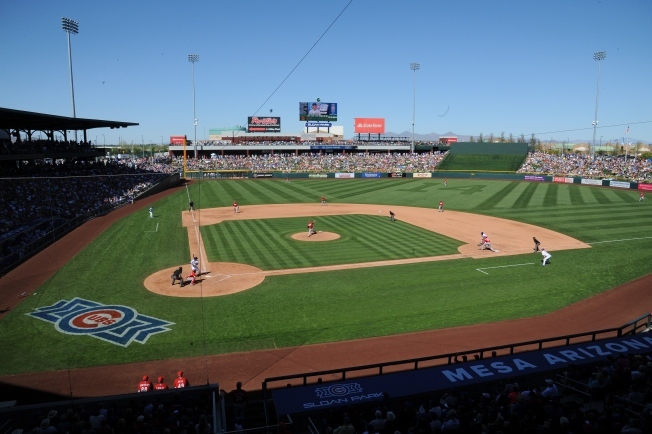 The Cubs have called the city of Mesa, Arizona home for spring training since 1979, but the past two years have been spent in some of the plushest digs in the Cactus League as they moved into Sloan Park before the 2014 spring season. The Cubs’ new abode, located just off the 202 freeway on the northern end of the city, is the newest of the Cactus League stadiums currently in use, and it mixes all the new features of spring training ballparks with plenty of callbacks to Wrigley Field in Chicago. The wall behind home plate? Made of bricks, just like at Wrigley. The scoreboard in left field? It features an old-school green clock with white hands and numbers, just like the one at the Friendly Confines. The light standards? The press box? All of them are designed to look like the Cubs’ equipment staff boxed them up and carried them 1800 miles west to Arizona. Despite all those homages to their famous home stadium, the Cubs’ park also features plenty of uniquely Arizona features to draw in crowds. Their outfield seating berm is one of the biggest in the Cactus League, and even during a weekday game against the Los Angeles Dodgers the grassy area was filled to capacity with families on picnic blankets and kids running around trying to score souvenirs from their favorite players. The Cubs also have plenty of other attractions for fans to check out as well. For the kids, a miniature baseball diamond for wiffle ball is stationed just beyond the center field fence. There are several team shops for fans to hunt for all the latest Cubs gear, and for those fans looking for a souvenir to send home, there is a replica of the famous red Wrigley Field marquee located down the first base line. Fans can have their names put up on the board and have their photos taken in front of it, presumably to send to family members and friends not lucky enough to escape the harsh Chicago winter and take in this desert oasis. For fans who are hungry at the game (and you will be as you walk around the expansive park), there is a mind-boggling number of food options to choose from. Whether you’re hungry for Mexican food, ice cream, or even Chicago-style deep dish pizza (the center field concession stand features Giordano’s pizza), there is a food stand to suit any palette. The main event within the stadium is the footlong Chicago-style hotdog. An oversized frank served on a large piece of French bread, this item will fulfill any appetite, and the line to get one was nearly as long as the Cubs’ current World Series drought. If you’re looking for something a bit off the beaten path, a shaded area beyond right field has something that Wrigley Field could never offer: food trucks. A sampling of the trucks invited into Wrigley West includes a truck from Iowa serving up breaded pork tenderloin sandwiches, a Phoenix-area truck called Burgers Amore that serves an incredible variety of burgers and toppings, and even one truck that serves 12 different variations on quesadillas. Traffic around the park is a bit difficult to work through both before and after games (the Cubs are the biggest draw in the Cactus League, routinely bringing in 15,000 fans to contests in Mesa), but with all of the amenities the ballpark provides, it’s definitely got to be on the visit-list for any fan heading out to Arizona for baseball and good times.